I can't believe no one has thought of this until now. I will never have to rearrange my cell phone charger plug, laptop plug, and the dozen others that fight for space on a traditional power strip ever again. UPDATED. 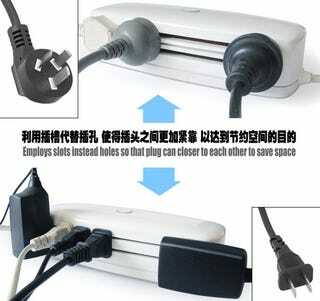 You can thank Chen Yinfeng for this innovation, called, appropriately, the Slot-Type Power Outlet. Rather than incorporating holes that you have to jam plugs into (and often, rearrange if there are more than one and they vary in shape), a swipe-in slot design is used. Now, the plugs can comfortably rest next to one another, thus allowing more plugs to fit than on a regular strip. The slots for 3-pin and 2-pin plugs are different (as shown in the pic above), but not difficult to manage.